Members of the Sisters of St. Francis of Perpetual Adoration received an early Easter gift when Pope Francis approved a decree of the Vatican’s Congregation of the Causes of the Saints that verified a miracle attributed to their foundress, Mother Maria Theresia Bonzel. The approval of that decree on March 27—Wednesday of Holy Week—paved the way for the beatification of Mother Theresia on Nov. 10 in Paderborn, Germany in the diocese in which she established her community in 1863. Twelve years later, she sent a group of sisters to Lafayette, Ind. to establish a hospital there. They now operate 14 hospitals across the Midwest, including Franciscan St. Francis Health facilities in Indianapolis and Mooresville. The motherhouse of those sisters who minister in central and southern Indiana is now in Mishawaka, Ind., in the Fort Wayne-South Bend Diocese. Franciscan Sister M. Madeleine Schumacker, previously a member of St. Louis Parish in Batesville, is a year away from making perpetual vows in the community and currently ministers in the community’s motherhouse. She learned about the decree on Holy Thursday. Franciscan Sister M. Angela Mellady was pleased at the timing of the decree for various reasons—as well as the fact that it was the first miracle approved by Pope Francis, who took the name of the order’s ultimate spiritual father, St. Francis of Assisi. The regional vice president of mission integration for Franciscan St. Francis Health in Indianapolis, Mooresville and Carmel, Ind., Sister Marlene said she has prayed for the beatification of her community’s foundress every day over the course of her 48 years in the community. When she had been a sister for 25 years, she visited her community’s motherhouse in Germany and prayed at the tomb of Mother Theresia. While she was happy to share the joy of the upcoming beatification with her fellow sisters, Sister Marlene was especially pleased to share the news by e-mail with the employees of the hospitals where she ministers. In a short time, she received dozens of congratulatory e-mails in reply and personal visits by overjoyed co-workers. “It was heartwarming and overwhelming and made me so proud to be part of this family,” Sister Marlene said. Franciscan Sister Maria Kolbe Elstro is much newer to the community than Sister Marlene. Previously a member of St. Andrew Parish in Richmond, she joined the community in 2009 and professed her first vows last year. Part of the path to heaven that she is walking on now is facing the challenges to religious freedom that religious orders, dioceses, private Catholic employers and others are facing in the abortifacient, sterilization and contraceptive mandate of the federal government’s Health and Human Services Administration (HHS), she said. That included the community being prohibited from accepting new members. So when interested women sought entry, they were sent to the United States. 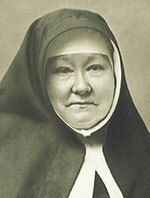 Mother Theresia made three trips to Indiana and other places in North America where the order had spread before she died in 1905. The first hospital founded by the order in the Archdiocese of Indianapolis, located in Beech Grove, was founded nine years later. Sister Angela sees the growth of the order in the United States as being directly related to the persecution it faced in Germany. And the courage that Mother Theresia showed in the face of that injustice inspires her and her fellow sisters today. “Without her courage and perseverance to live out our charism in spite of persecution from the [German] government, the foundation in America would not exist,” Sister Angela said. “She has been a powerful intercessor for us in recent times with the HHS regulations which threaten our religious liberty. Although Mother Theresia was committed to defending her community and its ministries, she was not sure what God’s will was for her as a young adult. She sought to join a Salesian women’s order, but a health crisis that arose the night before she was to enter their convent prevented her from doing so. Later, she was a founding member of another fledgling community. But when it decided to live by another rule other than one in the spirit of St. Francis of Assisi, she left it and was encouraged by the bishop of Paderborn to found her own community. She followed his advice, and the Sisters of St. Francis of Perpetual Adoration was established in 1863. Sister Madeleine thinks that Mother Theresia’s difficulty in discerning God’s will for her—yet her faithfulness throughout this trying time—can help today’s young adult Catholics identify with this religious sister who lived in Germany 150 years ago. “She trusted and she let God lead her on the path,” Sister Madeleine said. “She stayed faithful to prayer and daily Mass. She frequented the sacraments and entrusted herself to the advice of her spiritual director.